My daughter, a future foodie, loves to try new foods. We were at the grocery store almost 2 years ago when she discovered Vita Coco Pure Coconut water and asked me to buy some. I had tried coconut water in the past and didn’t like it, but ended up really enjoying Vita Coco. In May, they reached out to SuperKids Nutrition about their new kids line. 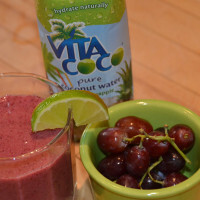 Check out this Vita Coco recipe below and more recipes featuring Vita Coco on SuperKids Nutrition.